Retired rock star Zal Yanovsky knew a thing or two about putting on a show. He also knew a lot about the craft of making latkes. Retired rock star Zal Yanovsky knew a thing or two about putting on a show. The former Lovin' Spoonful guitarist also knew a thing or two about making latkes, as he showed CBC viewers during an appearance on the late-night talk show Canada After Dark 40 years ago. Yanovsky was a guest in November 1978 to promote his new restaurant, Chez Piggy, which he and his wife were about to open in Kingston, Ont. He showed off some of the latkes he intended to serve his customers by making them in the studio with assistance from Canada After Dark host Paul Soles and fellow guests Don Arioli and Elwy Yost. Yanovsky began by chopping the onions, leaving Soles to crack some eggs while Arioli and Yost each grated potatoes. Moments before, Yanovsky had asked the house band for some music. They obliged him by providing a playful melody in the background. "There we go," said an appreciative Yanovsky, starting to nod his head along with the music. After he'd finished with the onions, Yanovsky folded them into the bowl of shredded potatoes, but told the unofficial, potato-grating sous-chefs to his left that "we're going to need a lot more potatoes yet." 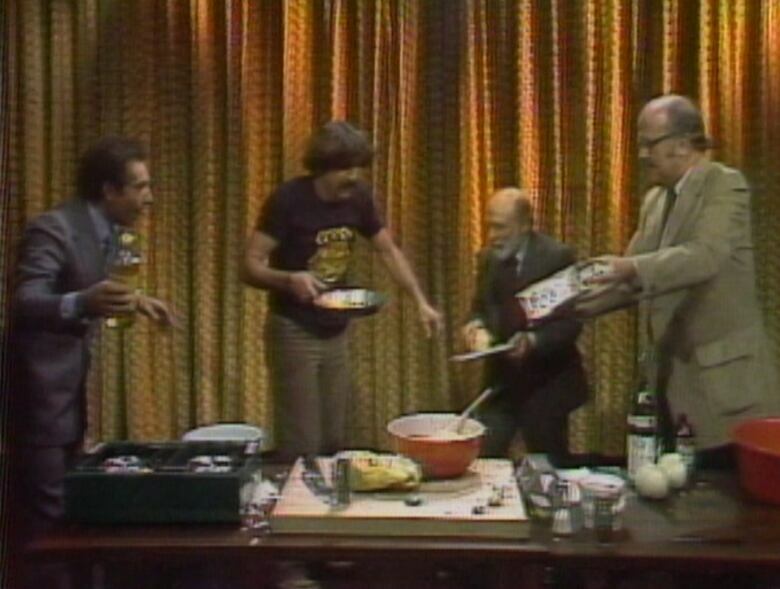 At one point, Yanovsky left Soles to prep the pan they would cook the latkes in. The rocker-turned-restaurateur told the audience that normally latkes would be cooked in schmaltz, or chicken fat. For the purposes of the TV show, though, they were going with oil — which is why Soles was looking for guidance from Yanovsky. "How much oil? How much oil?" Soles asked, after pouring a thick coat of oil in the pan. Glancing down, Yanovsky swore and grabbed the pan. "Too much oil!" he said, while dumping out the excess. Eventually, Yanovsky took control of the final product, mixing together the eggs, flour grated potatoes, onions and other ingredients — garlic, salt and paprika were mentioned — and then placing the mixture into the pan so it could fry. "Pardon the fingers here," Yanovsky said, using his bare hands for the job. The latke-to-be was a large one, taking up nearly half the pan, prompting Soles to ask "this is a potato latke?" "This is a potato latke," Yanovsky confirmed. Chez Piggy did open, as Yanovsky had told the show it would, and the restaurant remains in business today. Yanovsky, who would be inducted into the Rock & Roll Hall of Fame with the Lovin' Spoonful in 2000, remained in the restaurant business until his death in 2002.